As the inaugural North East Festival of Transport got into gear at Seaburn seafront, Go North East’s See It, Do It Sunderland bus made a special guest appearance alongside a selection of vintage vehicles. The display included buses, traction engines, commercial vehicles, classic cars and motorbikes, as event organisers the North East Bus Preservation Trust and Sunderland and District Classic Vehicle Society brought the region’s transport heritage to life. Held at Cliffe Park and Seaburn Park in Sunderland on 29 and 30 July, the event drew crowds from across the region and beyond looking for a nostalgic experience. Go North East’s modern ‘See It, Do It Sunderland’ bus lovingly contrasted with the heritage vehicle collection which included former Go Wear and Northern brands. 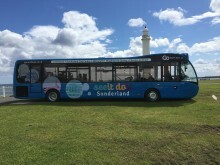 To help add some family fun to the event, the Wearside-branded cross city service bus, also hosted a face painter to entertain the youngsters. Trevor Hines, Secretary at the North East Bus Preservation Trust said: “We really appreciated Go North East’s help and support at the event – the face painting went down very well with the little ones and meant it was more of a day out for families. Following the success of the first show, organisers are now hoping to make the festival an annual event and are currently looking at dates for next year. There are also plans to extend the transport theme to include wider vintage pastimes and activities.